A Guide to Diesel Denim Jeans | DressCodeClothing.com's Official Blog. This is a guide to understanding Diesel denim jeans. I will touch on the different fits available within the brand. Also, be sure to check out my other Diesel articles regarding wash codes and denim treatment. My first pair of Diesel jeans were bought in late 2010. I still own my first pair and wear them occasionally. That being said—I believe that the right pair of jeans can hold up over years of wear; and still present itself with elegant style. I am writing this guide so that newcomers with the brand can familiarize themselves beyond just garments that hang in their closet. Furthermore, to educate shoppers for their next purchase. Many beginners overlook the importance of fit when it comes to purchasing their first pair of designer jeans. Fit is essential, a pair of premium denim jeans can only maximize your style if it is outfitted properly to your body. Below is a summary of the most popular diesel fits available. Please note that your sizing for most of the jean styles will remain inline. The only exception in Diesel denim sizing occurs when moving to a skinny fit. If you are moving between relaxed and straight leg fit there should almost no concern about changing sizes. Shioner: A classic skinny carrot fit jean. These jeans will sit low on your waist. They present a slim fit through the thigh and get even slimmer as the jean moves down to your ankle. To understand the carrot fit, simply Imagine a slim carrot: slightly wider at the top and narrows down to the tip. Zipper-fly. (My first pair of Diesels!) This fit is very similar to the Levi’s 511 Skinny jean. 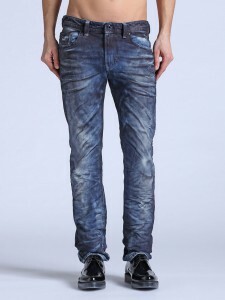 Thavar: This is Diesel’s signature and most popular take on their low rise skinny jean. I consider these jeans to be a slight bit slimmer than the 511 Levi’s jeans. However, they are not quite as skinny as the Levi’s 510. I consider these to be an essential to any Diesel fanatic if you can compromise a little comfort for the perfect skinny fit. Sleenker: One of the few mid-rise skinny jeans. The leg start as a slim leg and tapers down to a skinny fit. Most versions of the sleenker have a stretch fabric. Unlike most traditional skinny jeans, this one is a button-fly. Safado: Diesel argues that this is their most popular fit. The safado is a straight leg jean with a mid-rise. Typically a button-fly jean. This is Diesel’s premium take on the classics Levi’s 501 jean. Waykee: Mid-rise jean, straight leg jean with a Zip fly. One of Diesel’s re-take on the safado, however a slightly slimmer fit. 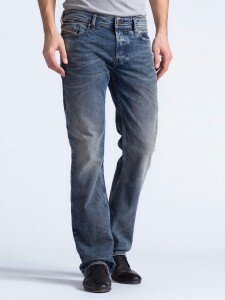 Viker: Mide Rise, straight leg Jeans with button-fly. I have been told that this style is being phased out of their line. However, this again is a classic re-take on the Levi’s 501 from a premium line. Zatiny: This pair of jeans is a slim boot-cut. I consider this to be a micro boot-cut because the flare near the bottom of the jeans is very minimal. Which makes it a great pair to outfit with either sneakers or boots. Button-fly. New-Fanker: Similar in fit to the Zatiny, the new fanker is a mid-rise slim bootcut jean with a button-fly. Zathan: Diesel’s classic bootcut jean. Button Fly closure. Currently Diesel’s only true bootcut option. However, there are plans of another mainstream bootcut option releasing late in 2014 that will also have a presence in their line. Darron: Presents a slim tapered fit with a mid-rise. This style jeans provides a slim-fit look with little compromise to comfort. This jean has the signature patch above the right back pocket. Typcially not seen in other Diesel jeans. Button-fly jean. Larkee: The relaxed straight leg option presented by Diesel. One word describes this jean: comfort. Plenty of room in seat and thigh. The jeans provide a very traditional look. Jogg: The jogg jean has received a lot of attention from Diesel in the past months. The jean itself comes in various fits– however it is more notorious for being available in the skinny / slim fits. The idea behind the jean is the material. Denim on the outside, however the inner parts of the jean are close to a sweat-pant material feel. This hybrid combination provides supreme comfort and Diesel’s notorious washes do not skip a beat on style. 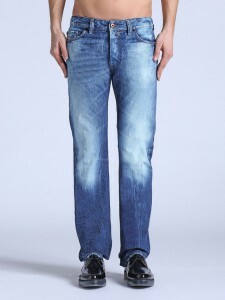 This jean has been at the front of Diesel’s marketing campaign as they bring style without any compromise to comfort.